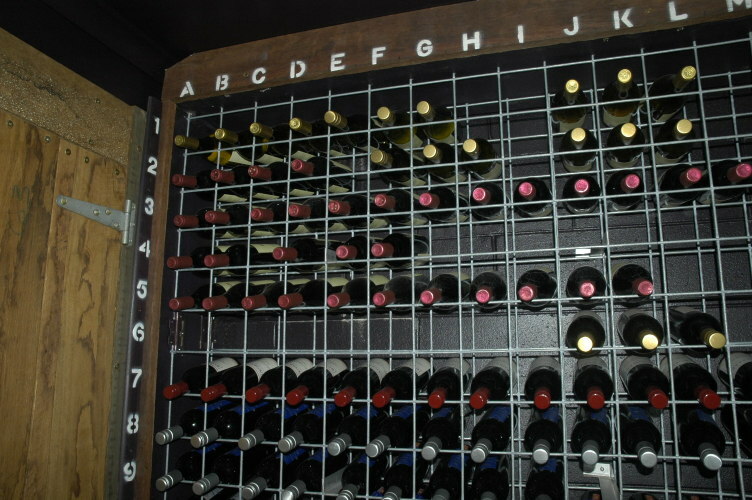 A suggestion for those people who might be considering constructing simple wine cellar racks and using Uncorked as the management system. I used MDF fibre board in preference to particle board on the top:bottom and both sides. The length of the sheets is the height of the opening available. Every 100mm the mesh stubbs are lodged into the matching holes on the sides and top to support the weight. Make the 12 bay sections up as modules. This allows for the obvious dozen bottles on each shelf. After installing the completed modules against a wall, I strongly suggest using some wall brackets be mounted on the rear walls every 600mm that protrude through the mesh and wired to both front and back sheets of mesh. Where 2 modules are side by side, I have mounted rough sawn hardwood as the facing pieces. This could be stained pine. The numbering scheme I use is the same as an EXCEL spreadsheet. Starting at the top LHS as A01. I stencil across the top A:B:C:D and Vertical 1;2;3;4;5 as to the opening height. I have 22 rows floor to ceiling in a room with a 2.4m ceiling. I set a user defined field as "Location" in Uncorked Cellar and the first bottle of each type logged at say AB 17 with the like type of bottles spreading to the right and the quantity mentioned in Uncorked. My wife and I built these with limited power tools and is certainly cheaper (and lighter) than the timber X section units I built in our previous house.